Sure, I read how much flak it received back then. I guess nobody was so easy to accept that a team of teenagers with attitude would be fighting off a thousands of year old menace, right? Also, Hirohisa Soda was starting to show signs of burnout and there are issues of ratings. There was also the controversial midseason change which was rumored from Yamimaru's popularity to simply Kanako Kishi and Masashi Ishibashi wanting to leave the set. Hmmm Real Life Writes Plot in here. But later, I guess Turboranger itself got vindicated by history with fandom who actually defend it to be a good series in spite of its flaws. Where do I start? 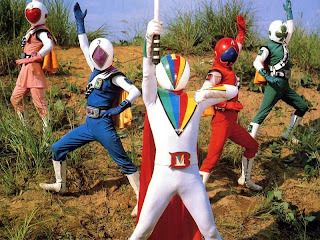 Fiveman itself was really the downfall of the Hirohisa Soda and it nearly killed Super Sentai during the 90s. 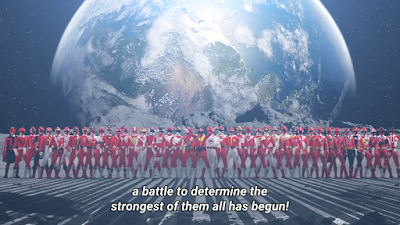 However, it didn't remain in bad record either for this reason -- Super Sentai World still featured them. 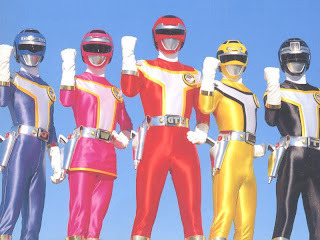 Filipino fans are not only fondly remembering Bioman, Maskman and Turboranger but also Fiveman. Can you imagine how Fiveman overtime got vindicated by history? Shout! Factory also wants to release Fiveman next from the pre-Zyuranger Super Sentai after GoGoFive was released some time ago. Made me wonder is Shout! Factory acknowledging that Fiveman is basically GoGoFive's template or what? Okay, I admit I am REALLY biased about this one since I started liking this series only because I don't like Power Rangers. It was basically overshadowed by Mighty Morphin' during the 90s though not in Japan. It was also because Jetman is a Tough Act to Follow and no amount of innovation made it an instant success. But years later? Well, Zyuranger did end up getting Vindicated by History when it became Shout! Factory's first factory release. Sure, I don't think it's solid gold but hey it started the trend of licensed Super Sentai DVDs! 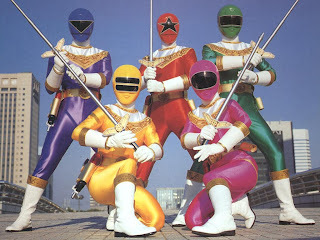 Without Zyuranger -- there would be no Mighty Morphin' and later without it there would be Shout! 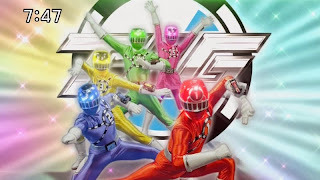 Factory DVD releases for Super Sentai! Ratings dropped really low after Kakuranger to just a 4.4% average. Oh boy, there's even that rumor that Ohranger nearly ended Super Sentai if it wasn't for the high toy sales. 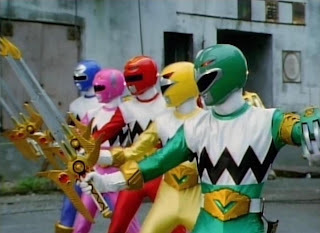 I remembered how this show tends to get some flak yet the Ohranger DVD sales was a success. 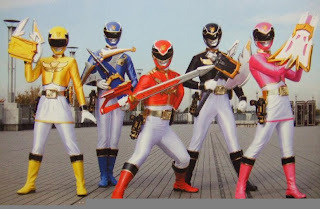 I wonder did more Power Rangers fans started to see how a self-contained series has more ideas or how Miyauchi beats Jason David Frank or how that "useless family" is way more relevant than Bulk and Skull? Can't really say! Sidenote -- the criminal behind the Sarin Gas cult finally got executed last July 16, 2018. No, Carranger DID NOT save Super Sentai either as the ratings barely went up from 4.4 to 4.8. This show tends to get criticized for being "unfunny" and maybe some prefer Go-Onger (which I'm still mixed about) over this one. 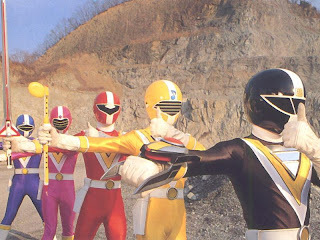 The Carranger DVD came in and sold making way for Megaranger -- the true series that saved Super Sentai! I guess people right now see the uniqueness behind this show though not everyone can appreciate it. At least, Carranger still kept DVD sales going. Oh boy where do I begin? There's a rumor that Lost Galaxy was supposedly more popular than the popular Gingaman in Japan -- but that was proven wrong. 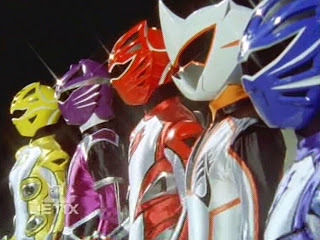 Lost Galaxy is popular to the American audience and Gingaman to the Japanese audience. 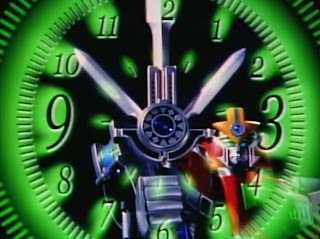 However, it seems that Gingaman had to deal with the fact that Megaranger is A Tough Act to Follow but it did get Vindicated by History as well. Gingaman DVD sales were good giving way for GoGoFive. 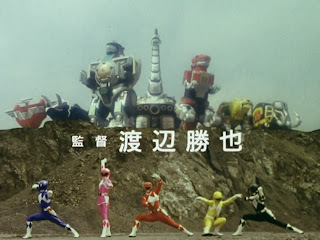 Maybe, Power Rangers fans wouldn't like this as much as other Super Sentai series (such as maybe Flashman for obvious reasons) but it still made the cut, didn't it? I think Boukenger is just that overrated! Now Gekiranger started going back to darker and edgier which Boukenger isn't. Personally, I do like Gekiranger better for its better written stories than Boukenger. However, I heard that it didn't do so well due to the Boukenger hype. If I'm not wrong it did get a following after it aired who ended up defending it. Hmmm need I mention it's highly possible that the Kalish era of Power Rangers' lack of quality may have indirectly helped it to be Vindicated by History? Boukenger is fun but I'd rather watch this show's progression of drama. 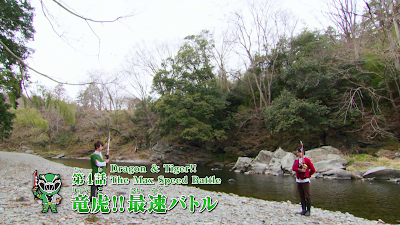 Goseiger is one show that I always felt like, "MEH!" though Buredoran is one badass villain in the later parts. I didn't like how "young" the cast looked and I had the bad habit of exclaiming "ERI!" a lot every time she did something stupid. 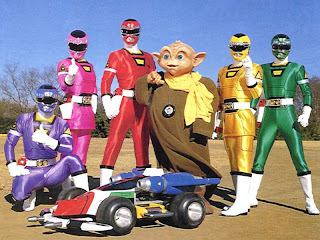 Then Power Rangers Megafart came -- which really is one of the biggest travesties on television! 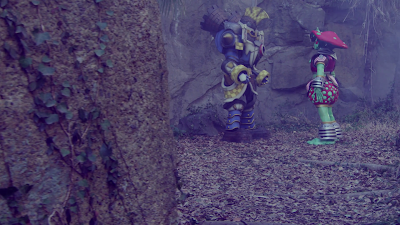 Megafart is so bad that it makes Goseiger look good! 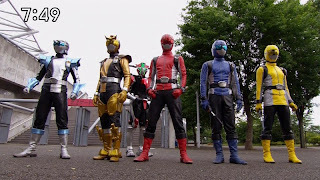 Probably the only reason why Goseiger didn't immediately succeed was because Shinkenger is A Tough Act fo Follow. Gokaiger is SO GOOD and well-loved that it literally overshadowed Go-Busters. Who doesn't enjoy a huge fan gathering and you wish that crowd never went away? Go-Busters started off with some lower ratings. However, it does have some older fans like myself. I for one am a fan of Go-Busters even if I don't consider it as Yasuko Kobayashi's best work -- my favorite works of hers are Timeranger (top favorite), Gingaman and Shinkenger (which I believe gets too much praise) but this one has the Faiz effect. Kobayashi started showing signs of burning out. Yet the series has its fans and I suspect some of them are actually Power Rangers fans too. Ratings have been dropping since Go-Busters and ToQGer wasn't even spared from that phenomenon. I remembered how I didn't immediately click to this show and I still think this is where Kobayashi had the same effect with Soda in Fiveman. It still got Vindicated by History when it won the Railroad Day Award and has its decent amount of fans that actually defend it to be a decent show. Right now, I end up liking it to a certain extent just like I like Fiveman and Kamen Rider Kiva -- both shows that were a result of a good writer's burnout. You want a REALLY BAD SHOW much worse than Ninninger? Look no further than that even way more horrible Power Rangers Ninja Steel. Lynn's burnout is way worse than Kobayashi -- at least Kobayashi still kept ToQGer somewhat intact unlike Ninja Steel. 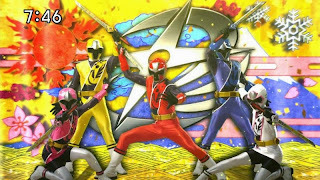 Ninninger may have been one of my least favorite seasons but it doesn't have Victor and Monty or even that annoying summer break Ninja Steel has. Hmmm I don't blame Power Rangers fans for actually overly berating Ninja Steel either for how terrible it really is! This has me thinking of it that Toei doesn't always get the winning formula right but they try to figure out whatever they can. Sure, there's some ups and downs but that's just part of life, right?